One way to enhance the appearance of your PowerPoint 2019 presentation is to include graphics on one or more slides. The graphics can be informative, such as a chart that displays sales results, or decorative, such as a cartoon smiley face that emphasizes the presentation’s good news. Click a slide (in either Normal or Outline view) to which you want to add a picture. In the Images group, click the Pictures icon. The Insert Picture dialog box appears. You may need to change folders or drives to find the picture file you want. Choose the picture file you want and then click Open. PowerPoint displays your chosen picture on the currently displayed slide. You may need to resize or move your picture. In the Images group, click the Online Pictures icon. 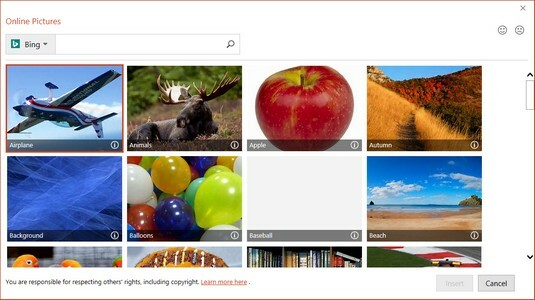 An Online Pictures window appears, giving you a choice of typing a picture description to look for clip art through the Bing image-search engine. You need an Internet connection to search for clip art with the Online Pictures command. Click in the Bing search text box and type a word that describes the type of image you want to find. The window displays all the clip-art images it can find that match the descriptive word you typed in Step 4. Choose the clip-art image you want to use and then click the Insert button. Be careful when using clip-art images from the Internet. Ideally, look for images clearly identified as in the public domain. Otherwise, you may need to obtain the rights to use a particular image by contacting the owner of the image. Click the slide (in either Normal or Outline view) to which you want to add WordArt. In the Text group, click the WordArt icon. Click a WordArt style to use. 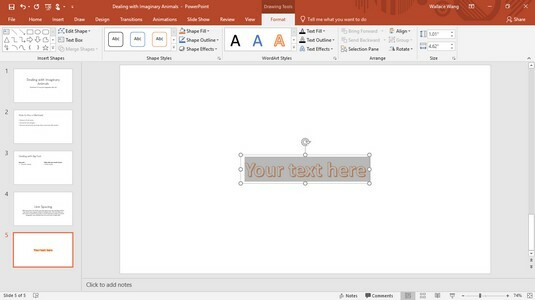 PowerPoint displays a WordArt text box on the current slide. A WordArt text box also displays the Drawing Tools Format tab. Click in the WordArt text box and type text. WordArt text doesn’t appear when you view slides in Outline view. Sometimes you may want to include an image of a computer screen to show how a program works or to show what a competitor’s website looks like. If you need a screenshot, PowerPoint can import all or part of a screen. Click the slide (in either Slide or Outline view) to which you want to add a screenshot. In the Images group, click the Screenshot icon. A menu appears, showing all currently open windows. Click a screenshot that you want to capture. PowerPoint displays the screenshot on the current slide. If you choose Screen Clipping from the bottom of the menu, you can drag the mouse to select just a portion of a screen to capture and store on your slide. Click the graphic (picture, clip art, screenshot, or WordArt) that you want to resize. PowerPoint displays handles around your chosen object. Move the mouse pointer over a handle. The mouse pointer turns into a two-way-pointing arrow. PowerPoint resizes your chosen graphic image. Release the left mouse button when you’re happy with the new size of your graphic image. Move the mouse pointer over the edge of the graphic image you want to move. The mouse turns into a four-way pointing arrow. PowerPoint moves your graphic image. Release the left mouse button when you’re happy with the new position of your graphic image. Click the graphic image you want to delete. PowerPoint displays handles around your chosen graphic image. PowerPoint deletes your chosen graphic image. Click the graphic image you want to rotate. PowerPoint displays handles around your image along with a green rotate handle. Move the mouse pointer over the rotate handle. The mouse pointer turns into a circular arrow. PowerPoint rotates your graphic image. If you hold down the Shift key while dragging the mouse, you can rotate an image at 15-degree increments. Release the left mouse button when you’re happy with the rotation of the image. PowerPoint treats graphics and text boxes as objects that you can move around on a slide. If you move one object over another, it may block part of another object. A layered object can obscure another object. When one object covers another one, PowerPoint considers the first object to be on top and the other object (the one being obscured) to be on the bottom. By moving objects from top to bottom (or vice versa), you can create unique visual effects (or just cover up parts of other objects by mistake). Click the graphic image you want to move. The Picture Tools Format tab appears. In the Arrange group, click the Bring Forward or Send Backward icon. PowerPoint rearranges the layering of your graphic images. You can also right-click an object and choose the Bring Forward or Send Backward command.